- Use various components of an INPUT statement to process raw data files including column and line pointer controls, and trailing @ controls. - Combine SAS data sets. - Access an Excel workbook. - Modify variable attributes using options and statements in the DATA step. - Use SAS functions to manipulate character data, numeric data, and SAS date values. - Process data using SAS arrays. - Validate and clean data. - Generate reports using ODS statements. The SAS has created this credential to assess the knowledge and understanding of a candidate in the area as above via the certification exam. 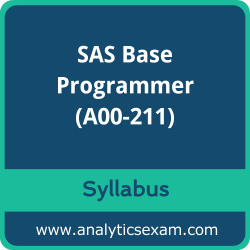 The SAS Base Programmer (A00-211) Certification exam contains a high value in the market being the brand value of the SAS attached with it. It is highly recommended to a candidate to do a thorough study and also get a hand full of the practice to clear SAS Certified Base Programmer for SAS 9 exam without any hiccups. There are currently 59 users and 362 guests online.